WELCOME TO MY MONEY MISSION ONLINE: HAVE YOU CHECKED YOUR STATS LATELY? HAVE YOU CHECKED YOUR STATS LATELY? Check the "Stats" on your blog and let me know where your audience is coming from! My Thursday wouldn't be complete without offering you a freebie! 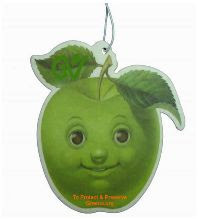 Green Association is offering a free air freshener. This freebie ships worldwide and it’s available to the first 12,000 to claim it! It looks so cute...hurry and snag yours!! *Thanks, Common Sense With Money. In the last week. Pretty cool! It even shows what operating system they're using and what browser! I used to look at that all the time! I loved it. I'll have to remember to go back and do that again. I am not as popular, or as international as you guys. LOL!